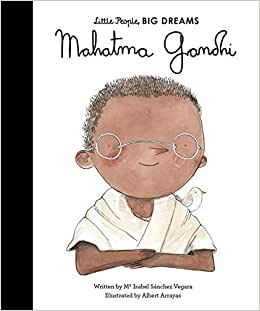 New in the Little People, Big Dreams series, discover the life of Mohandas Gandhi, the father of India, in this true story of his life. As a young teenager in India, Gandhi led a rebellious life and went against his parents' values. But as a young man, he started to form beliefs of his own that harked back to the Hindu principles of his childhood. Gandhi began to dream of unity for all peoples and religions. Inspired by this idea, he led peaceful protests to free India from British rule and unite the country—ending violence and unfair treatment. His bravery and free-thinking made him one of the most iconic people of peace in the world, known as 'Mahatma' meaning 'great soul'. With innovative illustrations and extra facts at the back, this empowering series celebrates the important life stories of wonderful people of the world. Pre-order Gandhi (Little People, BIG DREAMS) for your Kindle today.